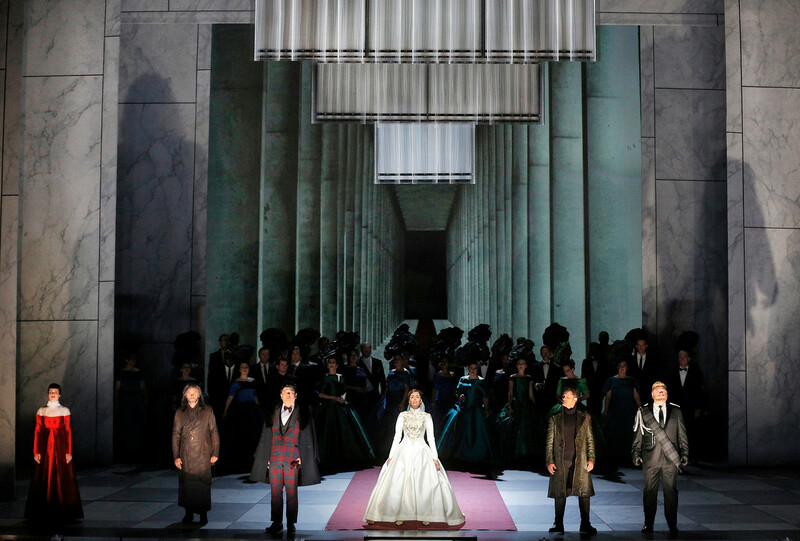 SF Opera’s new production of “Lucia di Lammermoor” captures our imaginations immediately with Scenic and Projection Designer Erhard Rom’s amazing, cinematic evocation of rural Scotland as the fog pours over the stage amidst convincing clouds that seem to hug the ground. The opening sequence offers moments of amazing visual enchantment. Brian Mulligan sings and acts convincingly as the villainous Enrico, and Nicolas Testé is a delight to despise as Raimondo, the chaplain who is none too Christian in his willing support of Enrico’s machinations against his sister’s happiness. As Edgardo, Lucia’s lover, Piotr Beczala is a suitably thrilling tenor. The first act, mostly expository, is capably performed by all, but let’s face it, Donizetti’s genius doesn’t really show itself fully until the justly famous sextet that closes the second act. Here, it is magnificently sung, and will disappoint nobody. Testé’s performance as Raimond is particularly notable here, although he could not be accused of overshadowing the ensemble. The effect is slightly marred by an unfortunate episode involving too many mirth-provoking oversized hats at the wedding party, inviting jokes about Beach Blanket Donizetti. Zanda Švēde (Alisa), Nicolas Testé (Raimondo), Chong Wang (Arturo), Nadine Sierra (Lucia), Piotr Beczala (Edgardo) and Brian Mulligan (Enrico), as silly hats bob in the background. The other great highlight is, of course, Lucia’s mad scene in Act III: a tour de force challenge for acting and coloratura singing that should leave the audience breathless with admiration. If Nadine Sierra’s performance in the earlier scenes is relatively pedestrian, she nevertheless rises in the Mad Scene to a pinnacle of excellence. Her handling of the Bel Canto ornamentation is superb, and she is wonderful in the famous cadenza with flute. After murding her husband on their wedding night, mad Lucia (Nadine Sierra) sings her bel canto heart out, magnificently. Photo Credit: Cory Weaver. Musically, this production is a first rate example of Bel Canto performance. Dramatically, it is often pedestrian, with the ghosts, for example, inspiring little fear and looking more like friendly clouds floating gently about. The great test for any Lucia is the handling of the sextet and the mad scene, and the virtuosity of the Bel Canto technique. On those grounds, this production is definitely a winner. “Lucia di Lammermoor” continues at the War Memorial Opera House with three more performances on October 21st, 24th, and 28th. For further information click here. “Lucia di Lammermoor” by Gaetano Donizetti, text by Salvadore Cammarano, based on The Bride of Lammermoor by Sir Walter Scott, produced by San Francisco Opera. Conductor: Nicola Luisotti. Director: Michael Cavanaugh. Scenie and Projection Designer: Erhard Rom. Costume Designer: Mattie UJllrich. Lighting Designer: Gary Marder. Chorus Director: Ian Robertson. Fight Director: Maier. Edgardo: Piotr Beczala. Normano: AJ Glueckert. Enrico: Brian Mulligan. Ramindo Bidebent: Nicolas Testé. Lucia: Nadine Sierra. Alisa: Zanda Ṧvēde. Arturo: Chong Wang. Posted in Reviews.Tagged AJ Glueckert, Brian Mjulligan, Charles Kruger, Chong Wang, Lucia di Lammermoor, MIchael Cavanagh, Nadine Sierra, Nicola Luisotti, Nicolas Testé, Piotr Beczala, San Francisco Opera, San Francisco theater reviews, theatrestorm, Zanda Ṧvēde.